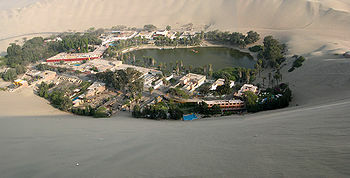 you can to visit the Huacachina located at 6 km from Ica. A charming village around an oasis with a beautiful lake and stunning sand dunes. The climate in Ica it is warm and dry during all the year with an average temperature of 25 ° C.
square km which were covered by huge drawings, and figures of insects, deities and mammals forged an approx. 300 AC. ; that nowadays continue as a grand mystery for the most demanding archeologists around the world. These enigmatic vestiges were declared world Heritage by UNESCO. those drawings, what technology they used and what was the real purpose of these lines. Paredones (Inca ruins), where you also will be able to find many crafts elaborated by ceramic artisans that keeps the traditions of these culture. it is located in the department of Ica a few hours to the south of Lima (3 hours), it is a combination of desert with sea and its cliff are surround it by a variety of birds and the penguins of Humboldt. The National Reserve of Paracas is the only protected area in Peru that includes a marine ecosystem. The place is a refuge for sea lions, Humboldt penguins, flamingos and other birds. This route includes a sea excursion to the Ballestas Islands, then during trip along the sea, you will able to appreciate a hillside, where there is a figure of Candelabrum (geoglyph over 120 meters long, also called Trident), similar to the Nazca Lines, but with a different source or origin. second it is the Aerodrome María Reiche in km 447 of Panamericana South highway (Nazca). Lima to Ica by air it is 45 minutos aproxx.. In the aerodrome of Nazca operate some companies that over fly the Nazca Lines. You can arrive from Lima, Ica, Chincha or Pisco in one of these non-regular flights. The Ballestas Islands are some islands in the Pacific Ocean near the coast of Peru. They are located 260 km south of Lima, near the town of Paracas in the Pisco province. The abundant life that exists in the Bay of Paracas and the islands is made possible by the cold Humboldt Current; due to the Humboldt Current is the water that fills the Ballestas Islands plankton and its microorganisms, further enriching the sea with shoals of fish, such as sole, cojinovas, croaker, toyos and anchovies. In the Ballestas Islands you will be able to see a variety of wildlife species such as The Humboldt penguin that is in danger of extinction, then marine wolfs and even dolphins that goes around the sea. The Paracas National Reserve it was created on September 25 of 1975. In order to keep a portion of the sea and the desert of Peru, giving protection to the various species of wildlife that live there. The national Reserve It is 260 km south of Lima. The trip from Lima takes 3 hours to 4 hours by car or bus. And Over 100 thousand people visit the reserve annually. During the tour of the Paracas Reserve you can see the attractive archaeological figure of the candelabrum and stunning works of nature as the Cathedral, and it’s beautiful beaches. Between the animals that live in the Paracas Reserve are: sea turtles, octopus, calm, clams, crabs, very much and lizards. The sea of Paracas has a rich variety of marine flora because their water flows favor the presence of plankton, phytoplankton and algae. Studies show that there are a range of 200 marine algae, such as weeds, sea lettuce, etc. The terrestrial flora of the Paracas Reserve is very poor because there is little rainfall and low humidity. 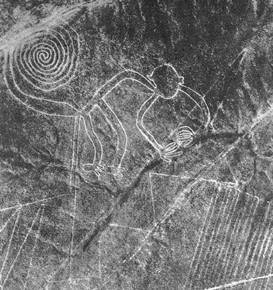 The "Nazca Lines, also known in the scientific world as "geoglyphs" are one of the most important legacies of the ancient pre-Inca cultures of Peru. Located in the valleys of Palpa and Nazca in the Peruvian department of Ica, this vast expanse of desert plains exposed on the sand huge geometric shapes in perfect harmony up pictures of animals, plants, objects, humans and gods. On the origin and meaning of these lines, archaeologists and researchers of paranormal events have raised several theories that interpret the set of lines as a huge astronomical calendar or a place of worship built by water cultures and Culture Nazca Paracas culture. These giant tracks and grooves up to 30 centimeters in depth form a vast network of lines and drawings in the sand. The conclusions state, according to researcher Kosok theory, which is a giant astronomical calendar signs, built over two thousand years. Aircraft fly over the Nazca plains is an unforgettable experience that allows us to appreciate the full extent of these singular lines. It is one of the most beautiful places in the Peruvian coast. Located five kilometers from the city, is an oasis of lush vegetation (dunes, palm trees, tamarisk and eucalyptus) with green sulphurous curative waters. The Carnivals are held in all provinces on Sunday in month of February. The feast of the Mermaid of the Huacachina is held from 13 to 15 February. From 13 February to 4 March, the black Festival of Chincha. The first half of March takes place massive Harvest Festival. -If you will travel by bus be sure that the company of your choice it is safe, has a well-known name and count with a prudent period of time on the market. - We recommend counting with travel insurance for any inconvenience or accident. - keep an eye to your stuff there is some robbery around. Especially at nights. - don’t approach to close at the animals at the moment of the excursions. -Dot not eat for less than s/.6.00 ($2.00) could be food in not a good state. -if you are foreign, it is really important to bring your original passport to do the overflight. -Bring bottles of water for the hydration to drink during the ride because the temperature reaches a maximum of 30°C (summer season) and it is a warm climate. -A sunblock and a hat to be protect of the sun. -A good repellent in order to avoid the insects. -the flights are subject to the climate conditions and to the control of traffic air. - Take a swimsuit with you in order to give you a fresh bath in the beautiful beaches of Paracas. - To ballestas islands wear a coat because although it is a warm weather, at the moment of be at the boat blows strong winds. The typical dish of Nazca is the Bofe, which is prepared with offal of beef; then is La Patita de Mani (Elaborated with pork and peanut); la Humita and tamales (based on corn). About the drinks: it is consumed the Cachina and other types of wines and piscos. In the city of Paracas and near to the beach you will find some stalls offering handicrafts and ornaments made of fossilized stones, polished stones, seashells and snails. Nazca is not particularly known for shopping. Still, you will find some good bargains and interesting shops around the city.